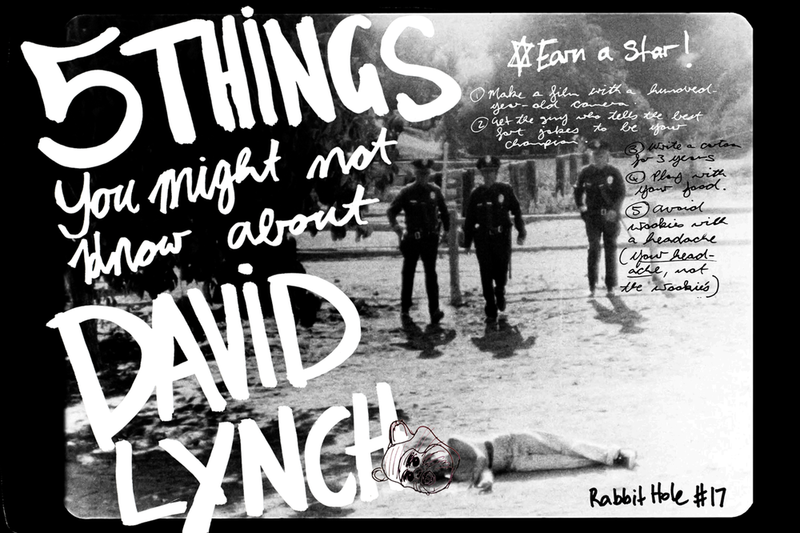 Working on a new essay-blog about David Lynch, I had these little leftover bits. But what to do with them? Well, write another blog. I love David Lynch's films, but they used to frighten me. Not because they're weird and scary, but because I didn't really understand them and I was too embarrassed to admit it to my artsy cool chain-smoking friends who would talk about them intelligently between long drags and slow dramatic exhales while looking down their noses. But now I realise that feeling of incomprehension is what makes them interesting. Lynch's films (damn, now I wanna cigarette) aren't intended to 'make sense' as much as they open up a space that allows you to entertain your own fantasies, dreams and demons while watching them. In addition to his contributions to film and television, Lynch has also created some amazing little-known shorts, paintings (he started out as a painter), photography, and even a cartoon strip. So, here are a few things about that, and some other stuff I found along the way. In 1995, Lynch made the wonderfully unsettling short, Premonition Following An Evil Deed. The film was part of a series of works by 41 directors who were invited to make a short films using an original Lumière Brother's Cinématographe camera. Each filmmaker had to adhere to three rules: (1) the finished product couldn't be longer than 52 seconds; (2) the film had to be 'silent', although they were allowed to use a score ; and (3) each director was permitted no more than three takes for each shot. If Lynch's films create a space for the viewer to dream in, then Premonition most definitely does that. Not only did Mel Brooks, the great comedian, actor, producer, director and screenwriter, produce The Elephant Man, but he also picked Lynch to direct at a time when Lynch had only made one film and no one knew who he was. Brooks had seen Eraserhead, and after meeting Lynch he decided that this Jimmy Stewart-looking, clean-cut, "Charles Lindbergh with a leather jacket," "wildest combination of a child and an old Einsteinian genius that I’ve ever met" was perfect to bring to life the unconscious elements Brooks felt were at the heart of the script (Mel Brooks Interview, 1981). "We are involved in a business venture. We screened the film for you to bring you up to date as to the status of that venture. Do not misconstrue this as our soliciting the input of raging primitives." (Quoted in Rodley, Lynch on Lynch 89). And his intransigent, uncompromising defense of the project didn't end there. Before its release, Brooks ended up taking his name off the credits for fear that audiences might mistake the piece for something else entirely. And that's how the man who describes himself as "the guy who is known for the best fart jokes in cinema" goes on to produce a film that's nominated for eight Academy Awards. 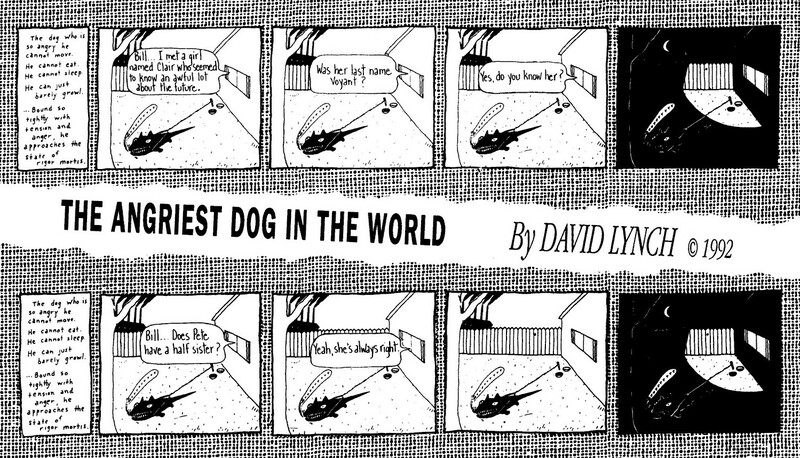 Lynch, believe it or not, had his own cartoon strip. "The dog who is so angry he cannot move. He cannot eat. He cannot sleep. He can just barely growl. Bound so tightly with tension and anger, he approaches the state of rigor mortis." Before each issue, Lynch would telephone the paper to tell them what speech bubbles and text he wanted to add—the content of which ranged between the two poles of the absurd and the dad joke. Et voilà—the idea for taking animals, disassembling them and photographing them was born. Lynch's "Fish Kit" even includes cute little instructions for when you've completed your fish like, "Feed your fish" and "Scrub your room." Lynch made both a "Fish Kit" and a "Chicken Kit." He also made a "Duck Kit" but an error with the exposure ruined the final picture. During the filming of Blue Velvet, he also planned to make a "Mouse Kit." He had twelve mice in the freezer-fridge of the house he was renting while shooting the film, which he forgot to take with him when he moved out. So, not the best tenant. George Lucas approached Lynch to direct Return of the Jedi. I'm still not sure if it would have been a good thing if he did accept, or whether it's great that he didn't. Would there be less dancing Ewoks? Maybe, instead, the Emperor would be dancing and speaking backwards in a red-curtained room? Who knows? "I started getting a little bit of a headache. He took me upstairs, and he showed me these things called Wookies. And now this headache is getting stronger." In the end Lynch passed on the project, feeling it was too much of Lucas's vision with no room for his own. Sad—the world missed out on an opportunity to see a lightsaber-fashioned "Ewok Kit."